Lauren Peńa is a 10th-grade English teacher in Oklahoma City with 10 years of experience. She's married and lives with her husband, stepson and 10-month-old daughter. She makes $43,000 a year. After starting off with $30,000 in loans, she has $6,000 left to pay off. She took out a 15-year loan, but she's hoping to pay it off next year, 12 years after she took it out. Some of her loans were forgiven because she worked in a Title I school and taught Spanish, a designated "high-need" subject. 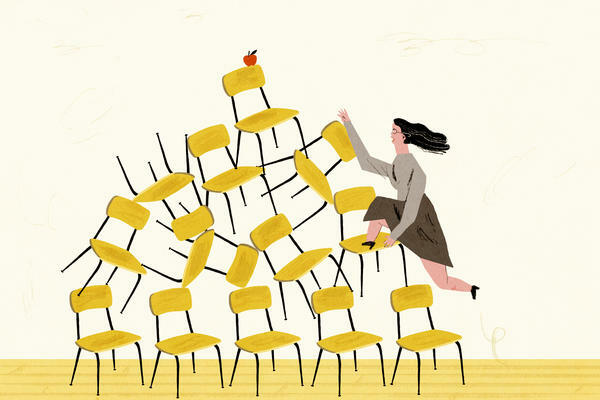 "I tell my students: 'If you're going to be a teacher or a social worker, or have one of these important jobs that doesn't really compensate very well — don't take out loans, because it doesn't make financial sense,' " she says. Peńa says she wishes someone had given her that advice — that maybe she'd have gone to a cheaper state school. "It's just like this suffocating debt," says Ashley Castelli, a middle school language arts teacher who lives near St. Louis. She has been a teacher for five years and borrowed $42,000 to get her bachelor's degree. She has been paying her loans for six years, but owes the same amount she took out because she's paying down only the interest each month, not her principal. She makes $41,000 a year. "I feel, like, kind of duped," says Castelli. "I don't ever look at myself as a teacher making enough money to get ahead of the loans that I had to have for the degree that was required for my job." She thought about enrolling in the Public Service Loan Forgiveness Program, but she doesn't want to pay less per month and have that program go away. Her expected payoff date is in 2026, but she's hoping she can do it by 2023. Andrew Kirk, 29, is a geography teacher in Dallas, approaching his fourth year of teaching. He holds both bachelor's and master's degrees in history. When Kirk, an AmeriCorps alum, started teaching, he had close to $150,000 in debt. By this time next year, he estimates he'll have $100,000. Kirk is enrolled in the Public Service Loan Forgiveness Program and its income-driven repayments, which allows him to pay down his private loans. By next year, he hopes to have just federal loans left. "Before I even knew about my options for repayments, I had a very pessimistic view about how things would turn out for me," Kirk says. "I thought that I'd always be a renter." He also worried about how "potential romantic partners" would see him. But the low monthly payments and the potential for forgiveness in 10 years have Kirk optimistic. Last year he got married and bought a home. "Those are some things I wouldn't have had the confidence to do without the security of a program like Public Service Loan Forgiveness," he says. Michelle Smithers, 28, is a special- and general-education teacher at a middle school in the Queens borough of New York City. She has been teaching for five years and has a master's degree — as required by the state of New York. She has about $80,000 in student loans — as does her husband. Smithers says they think paying off their loans is going to be "a forever thing." Smithers pays off her debt through income-driven repayments. She feels that her generation is "dealing with this ordeal," and that past generations "kind of frown upon us for having this loan debt." "They always say things like 'Well, I worked full time and went to school full time and paid off my tuition,' " explains Smithers. "But that wasn't really a possibility for anyone that I know." Tiffany Sanford, 33, works as an autism specialist at a school district in Portland, Ore. She provides early intervention for children from birth to 5 years. When she got her teaching licenses, Sanford had just shy of $30,000 in debt. Now she's closer to $25,000. "I think it's just been so normalized," Sanford says. "Everyone I know has student loans." Sanford got a federal Teacher Education Assistance grant, thinking it would be forgiven. But because she waited too long to get into the classroom — she first took a job in academia teaching other teachers — the $5,000 grant got added to her loans. She'll now have to pay that back with interest. Stephanie Plachy, 26, is a sixth-grade ELA/technology teacher at a Title I school in Brooklyn in New York City. Plachy started off with $75,000 in debt, and has so far paid off $15,000. She said it will take her about 10 years to pay off the remaining $60,000. Because she teaches at a low-income school, Plachy will get some loan forgiveness — $5,000 — after five years. She thought she'd also be able to qualify for the Public Service Loan Forgiveness program, but her time getting her master's degree reset the clock. "Because my loans were technically in deferment while I was in grad school, even though I was paying them off — the same payments I had been paying since I finished undergrad — those didn't count as qualifying payments," Plachy says. "So my 10 years of public service would have to start again." Plachy lives in the city with her dog and boyfriend. "Every time I look at how much money I owe, I freak out a little bit," Plachy says. "But from month to month, I try to make it work and not stress out about it too much." Danielle Bergeron teaches eighth-grade history in Kansas City, and just finished up her eighth year of teaching. She got her master's degree right after undergrad, with the promise of an extra salary bump in mind. She borrowed just under $50,000 and knows her remaining debt to the penny: $38,878.15. Bergeron expects to pay off her loans in 2026 or 2027. "I always thought that the government was more lenient with student loans, for education — like you were granted a lot of forgiveness," Bergeron says. "If I would have known it's just a tiny, tiny fraction, maybe I would have done something differently." But is she ready to leave teaching for a more lucrative career? "What's the point of going to school and having all this debt if I'm just going to leave education?" she says. Like Bergeron, teacher after teacher told us they love their jobs and don't want to leave. "The loans are stressful and the pay is not good, but it's totally worth it," says Lauren Peńa. Kayla Lattimore contributed to this report. Teachers have one of the lowest paid professional jobs in the U.S. You need a four-year degree, and that can be costly. An expensive degree plus a low-paying job equals a whole lot of student loan debt. Elissa Nadworny of the NPR Ed team talked with teachers who are trying to work through that math problem. ELISSA NADWORNY, BYLINE: When we talked to teachers about their student loans, we heard a lot of this. UNIDENTIFIED TEACHER #1: I mean, it's just like this suffocating debt. UNIDENTIFIED TEACHER #2: It feels like we're stuck to a ball and chain. UNIDENTIFIED TEACHER #3: Oh my gosh, but it's like never ending, it seems like. NADWORNY: Those are some of the 2,000 teachers that answered our call for their experience with student debt. We wanted to understand what makes this particular job even more vulnerable to a ton of debt. The first factor, of course, is chronically low teacher pay. On average, a teacher starts out making 32,000 a year. That's not super helpful for recent grads, considering the average student loan debt is about 34,000. LAUREN PENA: Professionals and with a college degree and look at the way they pay us. NADWORNY: Lauren Pena often hears that in the break room at school. She teaches 10th-grade English in Oklahoma City. And she remembers getting her first classroom job. PENA: After waitressing, it sounds awesome to make $35,000 a year. But you find that $35,000 doesn't go very far. NADWORNY: Especially when you're trying to pay off 30,000 with interest, like Pena is. PENA: I tell my students, if you're going to be, like, a teacher or a social worker or have one of these important jobs that doesn't really compensate very well, don't take out a bunch of loans because it just doesn't make financial sense. NADWORNY: Pena says she wishes someone had given her that advice. Maybe she'd have gone to a cheaper state school. Another big factor in all this debt, the increasing pressure to get a master's. Some schools and states require that teachers have that extra degree. And often, it's the only way to get a salary bump. ASHLEY CASTELLI: Yeah, I feel, like, kind of duped a little bit. NADWORNY: That's Ashley Castelli, a middle school language arts teacher who lives near St. Louis. CASTELLI: The best I can hope for, for a raise, is to go get my master's. But that would require more student loans. So it's a Catch-22. NADWORNY: That would be on top of the 42,000 she took out for her bachelor's. Castelli is trying to clear that debt in just 10 years, which means her monthly payments are about half her income. CASTELLI: I don't ever look at myself as a teacher making enough money to get ahead of the loans that I had to have for the degree that was required for my job. NADWORNY: And the teachers who do get masters', they're saddled with even more debt and, some told us, regret. That's combined with the rising cost of tuition and the seemingly limitless loans you can take out. UNIDENTIFIED TEACHER #4: Right now, I have about $60,000. UNIDENTIFIED TEACHER #6: Eighty-thousand dollars in debt. UNIDENTIFIED TEACHER #7: About 80,000 right now. UNIDENTIFIED TEACHER #8: About 100K. NADWORNY: Once teachers have that debt, there are many ways to repay. Some plans make payments more affordable. Others forgive balances altogether. There are specific programs that offer teachers some relief. The Public Service Loan Forgiveness is one. Qualifying teachers have their loans forgiven after 10 years of repayment. There's also forgiveness programs for teachers in low-income schools and for those who teach state-designated, critical-needs subjects, like science or special education. But this plethora of options can be really confusing. DANIELLE BERGERON: It's a mess. NADWORNY: That's Danielle Bergeron of Kansas City. She's in her eighth year of teaching middle school history. And she still owes about 40,000 from getting her bachelor's and master's. She says there's so much information, it just adds to the frustration. BERGERON: And every time you talk to these people on the phone through the loans, everyone gives you a different answer. NADWORNY: To keep track, she has a Google Doc with passwords, balances and pay-off dates. BERGERON: I mean, I have pages of notes from what people have told me about my loans and what to do. And everyone says something different. NADWORNY: She did get $5,000 of her federal loans forgiven because she taught in a low-income school for five years. BERGERON: I always thought that the government was more lenient with student loans for education, like you were granted a lot of forgiveness. And if I would had known it's just a tiny, tiny fraction, you know, maybe I would have done something differently. NADWORNY: But is she ready to leave teaching for a more lucrative career? BERGERON: What's the point in going to school and having all this debt if I'm just going to leave the - leave education? NADWORNY: And teacher after teacher told us they love their jobs. They don't want to leave. But as districts struggle to fill up open teaching positions and parents and policymakers pushed to improve the quality of our teaching force, it seems like something's got to give. Elissa Nadworny, NPR News. (SOUNDBITE OF THE END OF THE OCEAN'S "SOUTHERN SKIES") Transcript provided by NPR, Copyright NPR.